I stumbled over a recent article in our local newspaper the 'Byron Shire News' about a guy in the area trying to create a new form of 'Underwater Living' with the help of a local company producing Dome Shells. At first it seems like a very 'hippy' idea and really fits into our part of the world, as does the Dome Shell factory. However, on further investigation, the instigator, Shaun Waterford, seemed more down to earth than expected and I decided to take a look for myself. 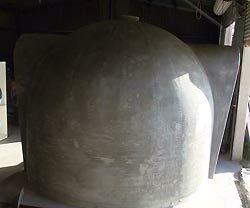 I met Shaun at the Billinudgel Dome Shell factory and he gave me a detailed rundown of the project and showed me the prototype AquaDome which is nearing the end of it construction. 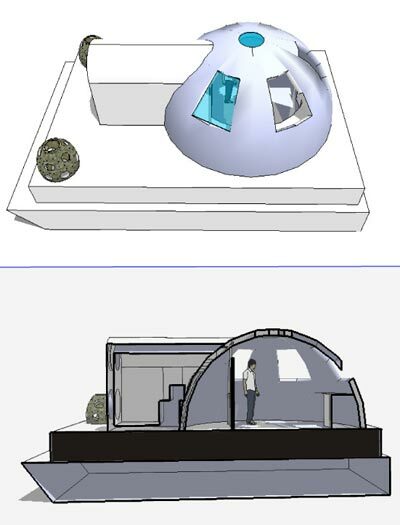 At 3 metres internal diametre it will be a small space to live in, but it will proof the concept from which bigger domes will be built. Of course the concept of living underwater is not new and people have spent already over two months in other underwater 'habitats', but Shaun is setting out to break the world record for the longest uninterrupted stay beneath water in his so called 'Habitat Waterford'. "The record now stands at 69 days, but our team intends to go down for three months" Shaun said. 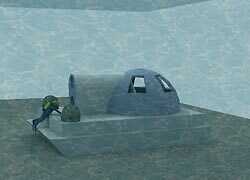 The 'underwater caravan' will have many potential uses, such as an aquaculture station, ocean monitoring station, a tourist location or a remote getaway. Shaun's aim is to set up a unique construction company that will supply the world-wide market with concrete underwater habitats to be used in artificial lakes and reef systems and tourism centres. "There are very few new spectacular engineering projects these days and this is one of the very few", Shaun said. The habitat is the result of 5 years research and development by Shaun Waterford including two years with a NASA think tank at Cape Canaveral. What began as an intellectual pursuit now seems very close to become a reality. Of course a project like this needs support, sponsorship and the permission by a local council to deploy the prototype. Despite a number of offers from overseas including the USA and Tonga, Shaun would prefer to keep the project in Australia for the prototype testing and the world record attempt. 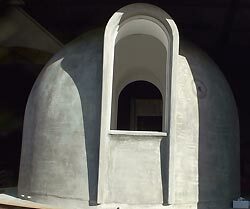 The ingenious use of concrete as the main building material and the shape of the domes makes the Habitat Waterford a very suitable and affordable option for 'underwater living' and the use of submersible barges for transportation of the domes to their proposed location is an easy and cheap method as well. Another key component of the project is the possibility to create artificial reef systems using the domes as concrete artificial reef units. The use of this material for creating artificial reefs with an international track record in over 59 countries, demonstrates that theses units can protect as well as rehabilitate reefs. "The key to their success is that they mimic natural reefs in form and function, quickly increasing fish numbers and diversity, as well as being rapidly colonised by corals, algae and sponges." Shaun said. Shaun also has a vision to involve local artists in his creation by inviting them to contribute to an underwater sculpture park that would complement everything taking place in the underwater kingdom. "All this would be at no cost to the local community, and sponsored by the corporate sector." Shaun said. "It would bring to the area international publicity, tourism promotion and an area for the community to enjoy." I am following his project with keen interest and we will report on new developments as they become available.